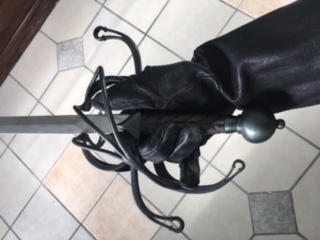 A beautiful Dark Wood original rapier. The grip has a smooth ricasso where the fingers wrap around the blade. It’s so comfortable with a great hand-feel. The blade is stiff and slips into pool form effortlessly. As with all rapiers, this sword is not meant to be a super cutter but it boasts a deadly thrust. This sword truly sings in your hand. Light weight, sleek, and comfortable to use – I am so pleased with this blade. The context surrounding the emergence of rapier, the civilian dueling weapon, marked by a sophisticated system specializing in thrusts over cuts that utilized an understanding of geometrical advantages and timing to defeat one's opponent. although Rapiers were never used in war. I could see this blade dong well in battle. 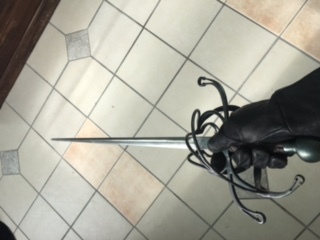 Scott Wilson of Darkwood Armory has replicated this rapier from the 1620's Italian nobility. 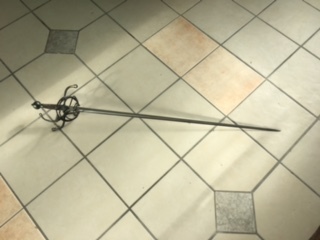 The Rapier was common in European courts, and existing examples can be seen in many museums. The detail and time taken on this piece shows in its craftsmanship. 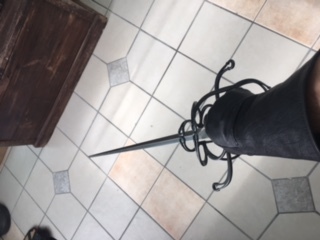 Scott specializes in practice rapiers for Hema and the SCA however i've had several of his sharp swords his craftsmanship and handling characteristics rival, Albion, Arms and Armour and Tinker. Just pay for his custom work not his "munitions grade stuff"
The Italian rapier is "lively" in the hand and lends itself well to a skilled swordsman as well as a novice. 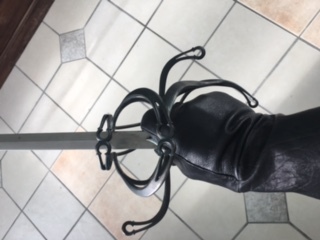 There is noticeable grip and guard presence; this is not only intentional, but optimal when using this rapier in the 17th century Italian styles of fence. This blade presence aids in commanding another opponent's blade in "finding the sword", the technique of gaining the mechanical advantage over the opposing weapon. Coupled with the balance attained with a substantial swept baskets hilt, rapier handles beautifully. The ricasso is slightly thicker than the blade, allowing the finger to comfortably wrap around the guard for control, but still giving the forte of the blade enough rigidity for parries. The tip control is excellent, and falls right into place on a lunge. Aesthetically this piece is breathtaking- nothing short of Darkwood's usual custom excellence. Rich-dark coloring, smooth lines and proportions, with a dash of subtle yet tasteful flair. 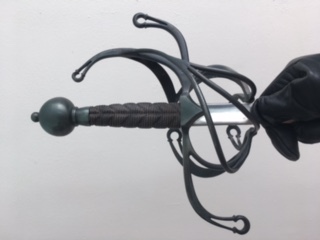 The basket around the hilt is waved beautifully, adding extra grip and fortitude, definately very well sculpted, and shows a unique understanding of form, elegance and function. On either side of the quillon block are piercings that add a very nice touch to the overall look without becoming gaudy in the least. The wire wrap alternates between twisted and straight wire, and is very tight and lovely. ( in fact its better then Vladimir Cervenka who up until now I thought did the best wire wraps in our world) The pommel is sculpted nicely and rounded evenly. The blade is close to perfect, deadly at the tip and sings through the air. Springs back into shape due to a good heat treat. Darkwood Armoury has recreated an excellent, historically accurate reproductions of bladed weapons. This Rapier is no exception. A fantastic example of both form and function of a Renaissance gentleman's side arm, this piece is a gem in any collector or practical swordsman. Handling this rapier is to understand handling an original sword of its style, and that is true testament to the work of Scott Wilson.